Traditional buildings were developed over a long period of time to create a sensitive solution to the particular characteristics of the environment in which they were constructed. These characteristics varied over the Arab world and, even in Qatar, varied between the coastal and interior developments due to the different conditions obtaining in those areas. As a result, the architecture differs slightly. Qatar enjoys a hot, humid maritime climate on its littoral with drier conditions in the interior. It can be relatively cold in winter and summer brings temperatures into the mid-40°s Celsius. The diurnal temperature range in the interior is greater than that on the coast. Rainfall can be heavy and localised, and hail is not unusual. Winds are strong from the shamal and the littoral experiences diurnal breezes on- and off-shore. The manner in which a tent responds to environmental conditions is very much different from that of a building constructed of hasa, stones and juss, mortar. The tent has been described elsewhere. At its simplest the heavy masonry walls take up energy from the sun by solar gain relatively slowly but, by the same token, give off their heat slowly and, importantly, there being a time lag for this process. Testing has demonstrated to be in the region of four hours. The solar energy gain is stored in the walls and then emitted as radiation which can have an effect on those sitting too near the wall. With a relatively small potential for obtaining and using cool air in the summer months, the buildings are designed to have tall volumes in which night air is collected, the openings closed and that air used until the internal conditions – warmed by the heated masonry walls – require the occupants to open the doors and windows to vent the hot air. These openings are left open through the night to allow the structure to cool down and the air inside the building to be replenished, when the process begins again. These volumes are ventilated, as is described below, and this complicates the above simple description, but this is the reason that Arab houses tend to have – to Western susceptibilities – very high ceilings. I should also mention that the courtyard acts as a reservoir for cool night air as well as the rooms as it is through the courtyard that the air enters the surrounding rooms. In winter there was a tendency to keep the rooms of the house closed in order to retain any heat they had in them. The relatively low sun doesn’t penetrate much of the courtyard and, in a tight urban situation, isn’t able to give much warmth to the vertical masonry either. Warmth was provided by small fires and, to a small extent, by body heat. In some parts of the Arab world rooms were provided for summer or winter use. In Qatar, this apparently wasn’t a feature, but there was a tendency to alter the use of rooms through the seasons in order to produce the optimal living conditions for all the family. Before you read these notes on traditional air-conditioning, I must point out that there are some significant differences between what I have learned in Qatar, and the experience of the wind towers in the Bastakiya, Dubai which has been well documented in the book by Dr Ann Coles and Peter Jackson. I shall make notes on this a little further down the page. This first photograph illustrates a form of the device generally recognised as a traditional wind tower. Taken in Doha in the 1970s, it bears witness to a perceived need to circulate air within a small residential compound, and the capability to construct a simple, functional device. Its rectangular form allows air to be introduced or led into, in this case a corner of the courtyard, in order to accommodate all possible variations in wind direction. In this case, controls relating to wind direction and strength can be varied by moving the sackcloth hanging over its apertures. 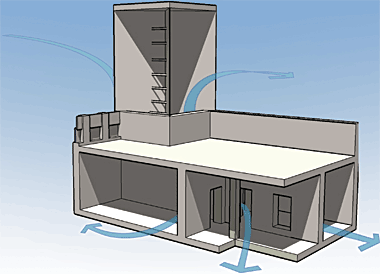 However, this is not the only form a wind tower might take – though it is the most common – but it is by far the most common arrangement for a tower in the immediate region. and fretted carved plaster panels – naqoush mefat’ha. The burj al-hawwa, or wind tower was designed for use in dense urban situations where there was a need to draw air down into the compact, courtyard houses. Wind towers were not found inland in Qatar as there was no need for them. Without the construction of such tall towers there would be no possibility to take advantage of the prevailing winds and breezes either from the shamal or from the on- and off-shore breezes associated with developments located by the sea. The section below illustrates the manner in which the burj al-hawwa worked. The array of windtowers above are in Dubai, not Qatar, as there is only a single original example left standing in Doha. However this windtower is part of a complex constructed for the purpose of filming, and is situated near Zikreet in the north of the peninsula. Unlike the examples above, the top of each wind opening has a simply decorated pattern, much in keeping with those in the Gulf generally, and Qatar in particular. The pattern is reversed and reflected in the treatment to the top of the windtower. The use of the mangrove poles is also relatively authentic. The windtower is sympathetic to the architecture of Qatar which is simpler than that of its neighbours where their footprint tends to be larger and the degree of decoration considerably greater. Other details of the compound are not quite right; for instance the badgheer on the walls are designed for effect rather than veracity – but this is a film set, after all. Here is another wind tower in Qatar, this time in the central suq which has been completely replaced by buildings constructed to replicate traditional architecture, more or less on the old urban pattern. You can see similarity between the two towers and, while I can’t speak for the tower at Zikreet, this in the suq is relatively effective, bringing the air down into a narrow passage which allows the air to move out and into the pedestrian system. Looking up the wind tower, in the second photograph, you can see the cross-bracing that has been introduced at 45° in order to strengthen the structure. To some extent the mangrove poles built into the vertical corner columns also provide a similar function. Note that there is no device for moderating the air moving down the wind tower, probably as this is not meant to be used as a working tower. Were it to be a working tower, then there is likely to be a need to prevent strong wind or shamal-borne sand moving down the tower. It is also worth noting that this tower is narrower than the reconstructed burj al-hawwa, the only authentic tower in the centre of Doha, the base of which is shown a little lower down the page. The wind tower above is a new design and construction, part of the reconstructed suq waqf development. However, this isometric drawing, made in 1983, is of the original wind tower in Doha and shows the relationship of the tower with the rest of its complex, though omitting the adjacent sikkak and the enclosed date palm and other planting. The original complex was reconstructed by the government in 1980 and small amendments made to it during this process, though generally it was left in its original form. In particular, the complex was left exposed with its sikkak removed, thus also removing its raison d’être – its capability of bringing light winds down within a crowded urban environment. In its original setting – the tight urban grain in the old, dense, centre of Doha – the actual wind tower element of the development was difficult to see and appreciate from the narrow adjacent sikkak. This lower drawing is a detail of the illustration above and shows a little more of the design with its associated construction describing more clearly how the design is a function of the methods and materials used in its construction. This is how local architectural vocabularies are developed from the materials and techniques available to those needing to provide themselves with shelter. It is interesting to see in this detail of the tower how much of the style of the building has developed from the need to create a comfortable environment for those living in it. The burj al-hawwa and the badgheer are very much features of Qatar’s indigenous architecture. In Qatar, as in the rest of the Gulf, the wind towers were constructed on a square plan and contained a cruciform device on the internal diagonals which allowed air to funnel down into a space at the bottom of the tower. This took place both through the direct impact of breezes striking the exposed face of the diagonals, as well as through the principle of convection on the other three faces when the structure was warmed by the sun and ambient air. From the photograph above you can see that, externally, the burj al-hawwa had mangrove poles sticking out of it at regular intervals all the way up. Those on the inside of the tower provided a natural built-in ladder for access and repair, and there appear to be two reasons for the external extensions. Firstly, there is an obvious need for tensile stability to be given to a structure weak in tension because of the materials of its construction – hasa stones and juss mortar. Not only do wind towers generally have mangrove poles built into them, but the poles are also normally found across the springing of decorative arches, as beams in the trabeated form of construction, and within the structure of walls for bonding corners as mentioned elsewhere. The second reason was provided by the need to have a safe platform for new construction as well as a basis for the refurbishment which was necessary periodically in order to maintain and safeguard the construction. These, in combination with the internal ladders would have given relatively safe access. Finally, as shown in this photograph, there was a grille of poles fixed horizontally across the inside of the air channels in order, I believe, to prevent birds flying into the building. The space at the bottom of the tower acted as a distribution volume as well as a place where any sand or dust carried by the winds could be deposited prior to being led on into the compound. This was accomplished by the provision of a small step, usually 150-300mm in height and which caught the heavier grains of sand. The top of the opening between the tower and the distribution room was kept relatively low – about 1500mm – thus increasing the velocity of the penetrating wind. When necessary, for instance in winter and in a shamal, the bottom of the shaft would be simply sealed through the closing of wooden shutters, bawabat al hawwa. I understand that this space at the bottom of the tower also had a drain to allow any rainwater penetrating to escape. Adjacent to the bottom of the wind tower there was a distribution space which led both to rooms as well as to the courtyard. Through the use of the burj al-hawwa it was possible to provide considerable ventilation to the house – both to its main rooms as well as to the open courtyards. One final device is worth noting here. Although I have never seen it I have been told that wet hessian was sometimes used at the bottom of the burj al-hawwa in order to help cool the breezes as well as filter dust. I don’t know how effective this might have been as I would have thought wet hessian would be relatively impenetrable and dry out rapidly. These two photographs have been added even though they have nothing to do with wind towers, however both of the structures reminded me of them and seem to have an association with the traditional architecture of the country. The first structure, on Al Bida with tall buildings of the New District of Doha behind, appears to have two chimneys elevated to a height where their exhaust is judged to have no or little nuisance for those moving in and around the building. The lower of these two photographs shows a structure created for pigeons. The outline of the structure resembles the primitive wind catchers that used to be seen in the old barasti settlements, but here provides a degree of shade and a vertical housing system for the owner’s birds. Many Qatari families keep birds and their housing can be seen in the private gardens around the peninsula. 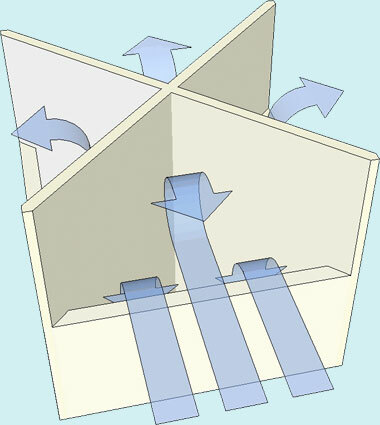 A structure such as this is sensible though, as is found with many similar devices, the top shading device can not provide adequate shading throughout the day. In addition to this I understand that the opening in a badgheer might also be used as a filter and conditioner by the use of scrub stuffed into the opening and watered. This is a device I have heard used in the windows of buildings in the middle of the desert. It is important to bear in mind that these abraaj al hawwa were intended to be constructed within relatively dense urban areas, and not standing alone as the simpler versions above – as well as the only one left in Doha and rehabilitated as an isolated structure. The example shown here illustrates something of the more normal character of the setting of these towers, this example having been photographed in the more dense Bastakia area of Dubai in the 1970s. There are important differences between the single wind tower in the centre of Doha and those to be found in the Bastakiya area of Dubai. It would be sensible to make a little detour and put down some notes on these differences – and similarities. The most significant has to do with the scale of the Bastakiya which is probably a reflection of the greater importance Dubai enjoyed with regard to trading within the Gulf. The Bastakiya was established on the south side of the Creek in Dubai by sunni iranians moving from their homes in Bastak, on the other side of the Gulf, at the beginning of the twentieth century. I don’t know why they selected this part of the Creek but it is significant in terms of orientation that their houses were aligned almost parallel to the Creek at this point, though slightly turned to be generally aligned pointing north-north-west or even north by north-north-west. This is similar to the direction in which the wind tower in Qatar is oriented. In Dubai the majority of the towers align to within 15° of north and a large number within 5° of this direction. The significance of this is in the way alignment affects air flow into a wind tower. Multi-directional wind towers – in contradistinction to uni-directional wind scoops which face a single direction – contain a cruciform arrangement in their centre to catch the wind and bring it down into the space below it. Though it might be thought that the more effective arrangement is to have the flat face of the tower oriented into the prevailing wind, it has been demonstrated that the tower is far more effective when the tower is oriented at 45° into the prevailing wind. When the wind hits the tower at 90° there is a smaller area available to the wind and it appears that there is turbulence created by the currents moving down and striking the fins of the wind catcher at 45°. This inhibits and slows the speed of the currents down into the space below the wind tower. Three of the four quadrants are available to the air moving out of the building due to negative pressure and the effect of warmed air moving upwards, but even though this might imply that this will encourage winds into the fourth quadrant, the effectiveness of the tower under these conditions is not as good as when the tower meets the winds at 45°. When the tower is oriented at 45° to the prevailing wind there is a larger area available to catch the wind and, meeting the wind currents at 90°, the air moves more directly down the tower, and with less turbulence at its entrance. In this case there are two channels of the quadrant available for air moving into the tower and, of course, two for the air moving out of the tower. I should also mention that the cornice at the top of the towers in Dubai is often a cantilevered, curved feature which helps to direct the air down and into the wind tower. These features are refinements which must have been considered or arrived at accidentally over a long period of time and then passed down from master builder to master builder, craftsmen who kept the plans and designs of buildings in their heads and, working with their clients, were able to produce workable and attractive solutions to their clients’s requirements. The above description relates to wind towers generally, but there is a significant difference between that in Doha and those in Dubai. The difference is in how the tower relates to the space at its base, and probably has to do with two characteristics – wealth and environmental conditions. 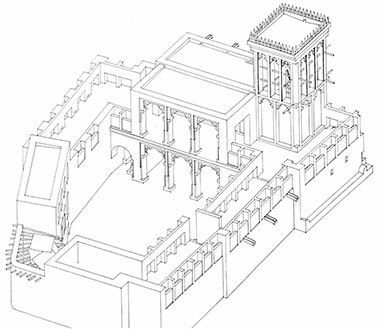 In Doha, as can be seen in the sketch further up the page, the wind tower sits on a room about twice the area of the tower. The room is provided with a sand trap and there are doors leading from the space enabling air to circulate into the spaces adjoining it. In the Bastakiya, by contrast, the wind towers sit on top of a space which is a usable room and significantly larger than the room in Doha. In fact the room is favoured to the extent that the owner is likely to have a bed sitting directly underneath the tower to take advantage of the breezes coming down it. Children used to sit under it during the day to carry out homework and it was essentially used as a pleasant resource for the family, the man of the house using the bed at night while his wife slept with the children elsewhere. This use implies that there was not the amount of sand and dust moving into the building as, with the Bastakiya being situated on the Creek and near to the sea to their north, it was the sea breezes, particularly in the afternoon which brought the cooling effect and which carried little sand. It is also significant that this was the time when the sun will have begun to heat the buildings and when the cooling effect is needed – more so than in the morning. In Doha the winds caught by the multi-directional wind tower move with the shamal down the length of the country, obviously carrying a significantly greater amount of dust or sand with it than is the case in Dubai. 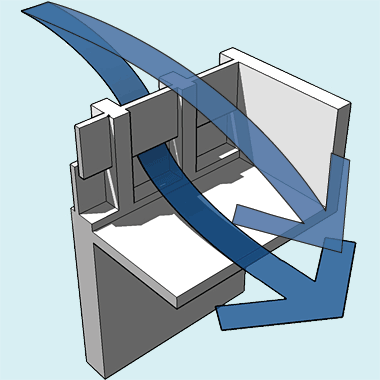 Tests have demonstrated that air currents within the space below the tower tend to move round the outside of the room, climbing to exit from those quadrants with negative air pressures in them and, in the process, keeping these spaces comfortable with between a 3°c to 5°c difference with the outside temperature. Elsewhere I have discussed comfort being a function of a combination of temperature, humidity and air movement over the skin. Unfortunately it has not yet been possible to take humidity readings in parallel with the temperature readings made in the Bastakiya, but the temperature values alone are significant and experience of living there has demonstrated that even at the height of summer, it is possible to remain comfortable indoors. One of the curious factors of air movement within a room is created by the relationship between the base of the tower and the ceiling of the room. As I have described above, the widths of rooms are constrained by the lengths to which mangrove poles can span safely. The Bastakiya rooms are often very long in order to create large, usable rooms and, like Qatar, the rooms are high in order to keep the hot air away from those using the room. 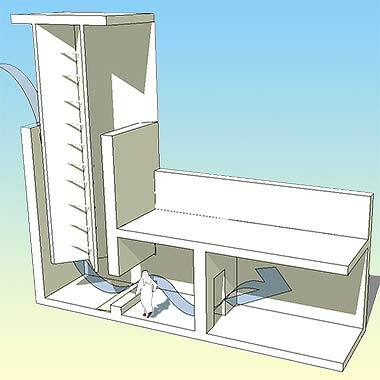 But the base of wind towers are no more than two metres from the floor of the room they ventilate so that, while this is no problem for the air being channelled into the room, air moving out has to be brought down and under the lip of the tower in order to make its escape. I don’t know the extent to which the incoming air movement was able to clear the hot air trapped above the level of the bottom lip of the wind tower but it is unlikely to have cleared it entirely. Perhaps this is an area where the mechanics of the wind tower could be improved. the placing and use of doors and windows to the room. Both the wind tower in Doha and those which used to exist in Wakra were multi-directional and were able to pick up both the shamal as well as onshore breezes to their east which would have carried less sand than the shamal. The Doha wind tower is situated now at a greater distance from the shore line so the onshore breezes are likely to have little or no effect, particularly as they have to traverse more heated land than previously. The people who settled in the Dubai Bastakiya were apparently more wealthy than those who settled in Doha. Their houses were not contiguous but generally stood as individual units separated by sikkak which provided shade and cooling to pedestrians, though opening up the boundary walls to potential heat gain. Their footprints were larger than houses in Qatar and were developed as courtyard houses with, often a depth of two rooms to each of their sides compared with the single rooms of Qatar. They were also developed as two storey enclosed buildings with the families using the ground and first floors, the ground floor favoured in winter, the first floor in summer. To some extent this mirrored what happened in Qatar with families living on the open roofs in summer, a practice which, while being practical and cool was also subject to the unpleasantness connected to pre-dawn dew, a characteristic also a problem in the desert. Compared with Qatar where development of courtyards favoured the north and west sides of the compound, in the Bastakiya, the houses were developed with the main rooms on the north and south side of the courtyard. Storage and functional rooms were located on the east and west, storage taking up a significant amount of space. This seems also to have been the case in Qatar though not to the same extent which I assume to be a function of comparative wealth. Kitchens in both countries were enclosed, as they were in adverse conditions in the khaimaat of the badu but in Qatar, the outside was favoured when it was practicable. The Bastakiya houses were also generally true two storey buildings. This meant that, where there were wind towers they vented into a first floor room rather than down to the ground floor where, in Doha, they had a role in bringing relatively cool air movement into the courtyard. The owners of houses in the Bastakiya were able to set out funds to build more than a single wind tower, some of them having up to three wind towers. These towers were not cheap. They had to be relatively high in order to place the opening as high as practicable in order both to catch the higher, faster winds as well as keep the openings away from the roof structure which would be relatively hot. The life of the family revolved around the courtyard and its adjacent verandahs and rooms in Qatar and in Dubai. Extended families occupied the houses with, perhaps, up to thirty living in the compound, the women organising and controlling the life of the house as I have written about elsewhere, and the men going about their business and entertaining male friends and passers-by in their majaalis adjacent to the sikkak where, when the shuttered windows were opened, anybody might enter. There is considerably more decoration on the buildings of the Bastakiya than there is in Qatar. Not only is there more it has both a different scale and character from the more conservative architecture of Qatar. Perhaps this is due to the wahhabi influence in Qatar I have described earlier, and the more figurative designs brought over from Iran by the sunni who would have recalled their artistic traditions in their new buildings. There are many subjects wrought in the decorative areas such as grilles and screens, but that of flowering vases seem to predominate. The other notable feature to me is the peculiar scale of the decoration which seems out of scale with the buildings and their occupation. But perhaps that is due to my being more familiar with Qatari architecture and decoration. I have dealt with sand and dust with regard to the wind tower in Doha. Provision was made at the foot of the tower in an attempt to minimise the nuisance this brings. In the Bastakiya it appears that, because of its situation with regard to prevailing winds and the location to water, dust and sand is not the problem it was in Doha. In Doha a simple drain deals with any rain water which gets into the building via the wind tower. I don’t know how this was dealt with in the Bastakiya though I am aware that wooden boards were used to block the quadrants when necessary. This also was the case in Doha, I’ve been told, though the provision for water egress and sand collection together with the fact that it was in small room which could be readily closed off, may have also made this less essential. Pigeons were mentioned to me as a problem and I understand that screens were sometimes introduced though, with the materials available to the household, this would have been likely to slow down air movement considerably. Security and perceived security have always been issues with Qataris. Just as in other countries, it is possible to enter other people’s properties if you really want to, and security is really only provided by systems and devices which slow down potential intrusion. Wind towers are not really insecure as the effort needed to get into them is greater than the effort needed to get over an outer wall or, perhaps, through a protected opening. Finally, here is a small selection of the towers to be found in the area known as the Bastakiya, Dubai, all of them photographed in the early and mid-1970s. The sketches made above illustrate the basic principle for catching and leading breezes into the lower spaces of buildings in dense urban situations. This example shows one of the abraaj al hawwa in its simplest of forms. I believe that the structure would have been more complete, but much of the frame had fallen or been disassembled when this photograph was taken. It is possible that the burj.shown above might have looked something similar to that shown here. For Dubai, this is a relatively simple design and shows two of the features needed for their construction. Firstly there are the mangrove poles built into the external face of the burj in order to create a degree of structural stability. Interestingly, the cross divisions within the burj could act as stiffening webs but, presumably because of their construction, the builders preferred to rely on strengthening the tower on its faces and not rely on the central elements. Secondly, note that there are mangrove poles let into the cross divisions, both strengthening them as well as creating a method of climbing up the inside of the structure for maintenance. While the example above has some styling treatment applied to it – in fact treating the corners and central column as a traditional columnar structure, clustering the corner columns and applying a simple capital device – this example shows a more sophisticated version with a perforated naqsh pattern, typical of Dubai but not Qatar, at the heads of the openings. As with many of these abraaj the mangrove poles have been taken through the columns and project around 800mm from its face. One issue of note is that the top mangrove cross-bracing is relatively high – as is particularly the case of the example above – and would have been better both visually and structurally a little lower. Note, also, that the top mangrove pole does not extend away from the face of the building, but a pole has been inserted to give the appearance of it being extended. Here the burj is a little more sophisticated in that the structure is more refined with the columns being narrower, and the top of the burj visually thinner, creating a lighter feeling for the whole structure. Again, as in the burj above, the mangrove poles strengthening the structure on its face have not been extended beyond the face of the building, but shorter poles have been inserted in order to give that impression. This burj al-hawwa seems to represent the most sophisticated of the abraaj in the Bastakia. There are no poles extending from its face, but strengthening poles can just be glimpsed running through the columns. The face of the burj has been divided into six openings a side with strongly expressed corners reflecting the problem – described in a number of places elsewhere – of bonding hasa at corners. Although the burj appears to be a more advanced design, the area of its openings could have been increased by having less columns on each face. All of the abraaj al-hawwa above have been provided with a mirzam to shed rainwater from its roof. You will see that there is a distinct difference in appearance between the burj above and all those preceding it. This difference has been created by the incorporation, or not, of the mangrove poles extending from the face of the burj. In design terms the extending poles create a implied further spatial quality to the structure, softening its appearance. This is a well-understood architectural device and it is interesting to speculate how it might have come about here. I suspect it is similar in this respect to the softening of long, horizontal roof or wall lines by the incorporation of shurfa in the tops of the wall. The horizontal form of badgheer is found both in the walls of rooms at ground and first floor as well as on open parapet walls, its purpose in both cases being to bring air into the space it serves at a low level. It s benefit in the case of roofs is to wash the roof surface with a breeze which will, to some extent, serve to cool the surface. This photograph shows a reconstructed example on the first floor of the wind tower development rehabilitated in the centre of Doha. Here is a badgheer arrangement seen from the outside and below on a building in need of repair. The construction of the badgheer can be clearly seen, though the upper element of the device’s vertical arrangement has disappeared. The supporting piers for the badgheer were constructed of desert hasa while the vertical planes of the device were usually made from faruwsh. While the badgheer may appear to be a rather simple arrangement when seen situated on roofs or from outside, inside it can create a rather different impression, as illustrated here. This photograph was taken inside one of the rooms of the Qatar National Development Exhibition building – the structure immediately to the east of the Sheikh’s Mosque – and illustrates not only the quality of light which is reflected into the building, but also a higher degree of decoration than is usual in traditional domestic buildings. It has traditionally been the custom of Arabs to use their rooms mainly sitting on the floors and it was therefore important that breezes should be directed to the floor, sweeping it with relatively cool air. This was also true of the roofs where families might sit in the evening and sleep at night, their privacy protected by high walls, w’arish, or raised parapet walls, sitara, usually to about head height – 1800mm. In both cases the badgheer was constructed of a material such as faruwsh and consisted of two vertical panels in line with the wall and located between the walls’ stone pillars, the upper one being located nearer the internal space in relation to the lower one. Winds striking the upper panel were deflected downwards through the gap of about 100mm between them, and then moved over the surface of the internal floor clearing it of any stale air. When it was necessary to protect the inside of a room from the shamal or from rain a fraym fat’ha al badgheer, wooden shutter, was closed over it on the outside. These shutters were often omitted and are usually of a crude design and construction. Although nearly all badgheer are designed to have the upper panel set back a significant distance – around 150mm – from the lower panel on the side facing the prevailing wind, this is not always the case. This photograph, taken in Doha in the 1970s, shows both upper and lower panels set on almost the same plane. The photograph also shows a method of supporting a cantilevered first floor corner in order that the ground floor can be rounded, a functional resolution both from a structural point of view – there being no proper bonding of the irregular stones making up the wall – while easing the passage of pedestrians around the corner of the relatively narrow sikkak which skirted the building. Although this was the traditional way of providing ventilation to the first floor, there was another way of effecting this as is shown in this photograph as well as can be seen in a photo further up the page. Here there appears not to have been a problem with privacy and so, instead of a badgheer, a timber grille was provided for both security and some form of privacy. I don’t know when one was necessary rather than the other, but suspect it was due to the lack of visitors to the compound it overlooked. It is interesting to see how dramatically it alters the character of the building. It also visually softens the junction of sky and building compared with that provided by a solid building roof line as is discussed below. The badgheer was not used solely to provide breezes on roofs, but was a major element of enclosed rooms where its purpose was to introduce air movement within them when there were light winds available, and to wash out warm air which had built up, usually during the latter part of the day. This sketch shows a typical arrangement. Bear in mind that those using the space generally sat at floor level and so the breezes would have brought a degree of comfort directly to them. It is notable that not only did the badgheer provide and direct air movement, it also created an indirect light source at a low level to the room. Its main disadvantage was that there was often no control available at its opening to moderate wind and associated dust, and to prevent rain ingress. Consequently, a relatively simple shutter was introduced on the outside of the opening. 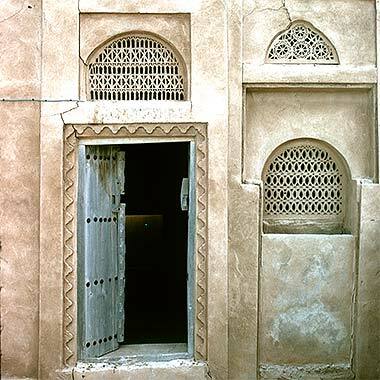 The photograph is of a system on an old building in Wakra taken around 1975 and shows a relatively sophisticated construction with the shutter fitting into a wooden frame. From its appearance this would be a relatively sound manner of excluding wind and its attendant sand or dust, but might have been less effective at preventing rain ingress due to the junction of the shutter and its frame being exposed directly to falling rain. A small wooden batten was fixed along the bottom lip of the upper panel to which a wooden flap was hinged. The shutter was able to stand in two positions – up, when it leaned against the upper panel of the badgheer, and down, when it closed off the opening. A short string was usually attached to its outer lip in order to be able to bring it down when needed. Although the shutter was neither dust nor rain proof, it obviously provided optimal protection against at least the dust and rain. Although this sketch replicates the photograph above it, I have also seen a simpler device which just overhangs the bottom panel of the badgheer and which, although not being as sound as this illustration, is likely to perform better in rain. A variation of the open badgheer was that used when located in the wall of an enclosed room. The structure is similar to that of the ordinary badgheer but has a fraym fat’ha al badgheer added to it which enables the space to be closed if it is raining, or when a shamal drives sand at the building. The fraym is constructed of a wooden panel set at about 30° with a small overlap to the face of the building in order to shed water. Above can be seen four of them with, curiously, two open naqsh carved panels. I don’t know how the panels were secured against rain and sand ingress. The third form of ventilation system, naqoush mefat’ha, is rarely seen in Qatar. 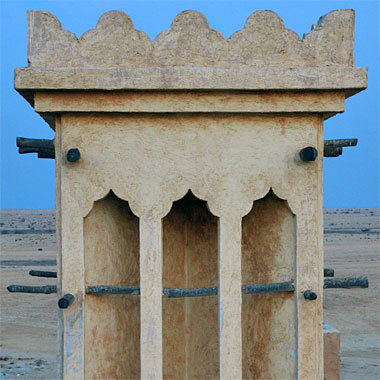 Extant examples can be seen at the old palace of Sheikh Hamad bin Abdullah at Rayyan, the wind tower building in the centre of Doha and in some of the buildings in al Wakra. The system took the naqsh relief carving which is seen on many buildings, but had the carving taken right through the plaster panel, normally about 50mm thick. Its chief drawback was that it made the panel extremely fragile and it could not be easily sealed off in high winds or rain. Consequently its use appears to have been limited to areas where closing is not important, mainly staircase walls and at high levels in certain rooms where it had the added advantage of allowing the exhaust of warm or hot air at the tops of rooms. This next group of photographs illustrates old examples of the naqoush mefat’ha used in some of the ordinary two storey building in Wakra. Sadly the plasterwork has all gone, along with the buildings that contained them, the photographs having been taken in the early 1970s. However, it is possible to see from these photographs that these were beautiful examples of their sort. Even though there is a sense of primitive design about them, their irregularity gives them a vitality that is often missing in the more modern examples such as the newly carved panels in the three photographs above. The eccentricity of these old panels is particularly noticeable in the bottom right panel of the lower photograph where part of the panel is broken out and, to a lesser extent, also in the top right panel of the upper photograph. In the lower of the photographs above, you will see in the top left corner a semicircular perforated naqsh carving, found in Wakra, 1976, which is the only example of seven-pointed geometric design I came across in the peninsula. This photograph shows it in more detail, illustrating that the choice of seven-pointed geometry is deliberate with symmetry around a central vertical line, but a symmetry which extended neither to the five-pointed rosette at the top nor to the linkage lines joining it to the seven-pointed rosettes on the lower row. The carved decorative naqsh panel in the wall below the panel illustrated above, is of a much simpler geometric design. Here it is shown at a larger scale for closer examination. While there is a degree of coherence in the setting out, the extension of the diagonal lines into the top of the panel has not been as logically resolved as happens in the example below, nor are the diagonal lines as regularly formed. This design has been established solely with horizontal, vertical and diagonal lines which maintain a degree of harmony with the general design of trabeated structures, and contrast with the semicircle head to the panel in which it is being used. While there are no other designs based on seven-pointed geometry in the building – nor, as far as I am aware, in the rest of the peninsula – the simple design shown here occurs in a number of buildings. This photograph, taken in the same structure, shows a deeper panel with the same, or similarly designed setting out geometry utilised in its design and construction, there being small variations in execution both at its head and upper sides. The widths of the two panels are similar, so it is surprising to see that the upper panel is not as regularly formed as the lower. The character of geometrical framework can be seen to be similar in this example, again taken from the same building. The framework for this design is more constraining so the decision has evidently been taken to simplify the design in order to carry it out more easily. The way in which the diagonals meet the horizontal and vertical elements of the design tends to create a semblance of cursive or circular elements in the design, making it more sympathetic to the cursive frame in which it sits. These decorative, perforated naqsh panels have been used in this Wakra building at high level, above any windows, doors or badgheer panels. Note that the panels illustrated here are, more or less, like that shown here, the others appear to be squashed due to the angle at which the photographs were taken. It is difficult to know how the shape of the frame came about, but it may be that this arrangement or, better, the seven-point rosette example above, may have suggested the shape. If that were to be the case then these next two examples seem to defy any such consideration. This suggests that these designs truly are random and do not relate to an underlying logic in fitting within this particular frame. The first of this pair of designs has an extremely poorly resolved geometry at its head and outside lower corners. It is difficult to understand the thought processes that went into its layout and fabrication. The lower of the two panels is also irrationally laid out. The four circles at the bottom should allow a single, central rosette above – or at least two equal rosettes – but somehow the decision has been taken to create two unequally sized rosettes which are a poor way in which to resolve the design of the top of the panel. However, this apparent lack of logic behind the design of naqsh panels can be thought attractive as it produces designs which have a disbalance that creates interesting, if not intriguing designs, well worth study. Here are three more panels from the same building, this time from the lower level of panels. This first panel demonstrates eccentricity of layout in both the lower and upper rows of circles. While there is a geometric connection between the two rows, neither row is symmetrically organised about the centre of the panel and the partial top, central circle, is neither complete nor central. The next two panels are far more accurately laid out. Bear in mind that all these panels occur within the same building, some of them located adjacent to each other as, in fact, are this pair of panels. In contrast to the design above, this panel is almost perfect in its underlying geometry. Because of this it might appear a little more static, but there are sufficient eccentricities in its execution to create a liveliness which both enriches and attracts the eye. The last of these panel designs also attracts due to the small variations in carving. Most of these panels are relatively delicate, but the blades on these spirals are very narrow in places suggesting potential fragility. The carving of spirals has been looked at elsewhere where, generally, the spirals are more accurately laid out, perhaps because they are surface carved and not perforated as are these. What is interesting here is that the spirals have, respectively, nineteen blades at the top, and twenty-one and twenty-two at the bottom. None of these geometries would be easy to lay out accurately suggesting that the spirals would have been created by trial and error. In the next example, below, note the decoration around the doorway. It has a scale that gives emphasis to the door, but it is apparent that the detailing at its top corners is not symmetrical, indicating a lack of concern or, as was once expressed to me, a desire not to have anything perfect, as there is only a single source of perfection. The importance of the panels illustrated in this photograph is that the panel over the door and the lower panel on the right both have patterns that are essentially linear patterns that repeat horizontally to fill the semi-circular headed openings. There is no effort made to use the geometry of the opening to create a pattern that integrates with the curve of the arch. This is a simplistic way in which to create a pattern within such a strong geometric outline, but one which creates a significant character to the panel when compared with the newer examples above. On the entrance wall to this ground floor level room there are perforated panels over the entrance door to one of the rooms as well as at high level. However, there is also a perforated panel over what would normally be considered to be a window but is really a form of badgheer, this being the only example of its sort I can recall seeing. Ventilating panels of this sort are usually seen at relatively high levels, as with the door overpanel and the panel top right. The carving of the three examples in the wall above is fine and permits a considerable amount of air to move into and out of the room. 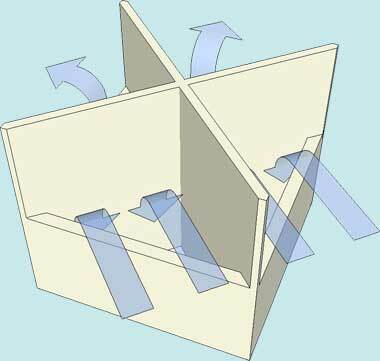 The panel which has been incorporated into the badgheer will permit air to move through it while still permitting a part of any breeze to move down and into the room. Generally, the badgheer is designed to catch winds blown straight at it, deflecting them down and into the room through the horizontal gap between its two vertical elements. It must be assumed that, within a courtyard, there is unlikely to be such winds blowing so it is impossible to understand why the perforated panel was incorporated other than to increase the possibility for air movement. There are a pair of photographs above which illustrate relatively modern interpretations of the original carved naqsh panels that were incorporated into the wind tower, preserved in the centre of Doha as the only extant example of its kind in the peninsula. Here, by way of contrast, are three photographs of a building in Wakra, photographed in April 1975, and illustrating the same principle in one of the buildings developed near the sea shore. The first photograph is interesting for a number of different reasons, but in the context of this note it is the ventilating panels which are important. On the entrance wall to this ground floor level room there are perforated panels over the entrance door to one of the rooms as well as at high level. However, there is also a perforated panel over what would normally be considered to be a window but is really a form of badgheer, this being the only example of its sort I can recall seeing. 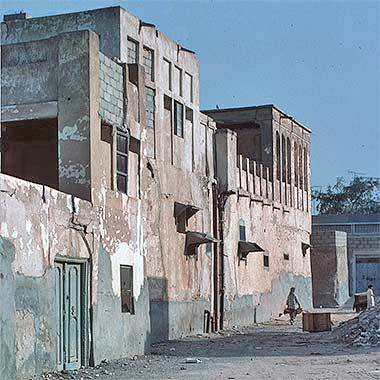 The next four photographs are of part of a building in Wakra, photographed in April 1975. Specifically, the photographs illustrate a first floor room, the first two photographs taken from the outside, the second two taken from the inside and, closer, from the outside. The panels shown in the internal photograph are the two panels to the right of those shown in the lower external photograph. Incidentally, the post on one corner of the building’s roof seems to be a hollow pipe supporting an aerial or pole, out of picture. Although many of the surrounding buildings had been abandoned, this building was still being used to store goods in as well as keep pigeons. On the right of the lower photograph that cement blocks have been used to make good the badgheer system at first floor level. As you can see, the building is not in a good state of repair and I believe it had been partially abandoned when I photographed it. Projecting danjal were being used to locate boxes used for breeding pigeons although, internally, the rooms were habitable while being open to the elements through the naqoush mefat’ha. But the panels show that the building had provenance. The two patterns used to fill the openings in the semi-circular window heads are more suited to their location than that above. The pattern on the left is a repeat pattern that better suits the shape of its container, while that on the right is specifically shaped to take account of the shape of the containing arch. It is, however, eccentric in its setting out and is not symmetrical about the vertical axis. This, again, suggests that the work was carried out quickly, and that there was no concern for regularity or symmetry from those carrying out the carving. The above examples of naqoush mefat’ha are relatively large panels, designed not just for their functional purpose but also their decorative effect. But many buildings had small naqoush mefat’ha panels near the tops of their rooms that were more functional than decorative. They were located at high levels within rooms in order to vent some of the hot air that accumulated during the heat of the summer days. Note two other aspects of the room: firstly the peg in the wall on the right which is a watad to the right on which to hang clothing and, secondly, the frieze at the top of the wall which creates an attractive junction with the ceiling. There is more on this type of decoration on the next page. There were also many examples of panels used at lower levels in a building such as this example photographed in Wakra in 1975. The panel was located immediately adjacent to an iwaan, the first arch of which can be seen to the right. Its location will have had little effect on air circulation but might have been useful in allowing a small amount of air movement as well as introducing a little more light to the blind end of the iwaan. This was a building of some importance, its architecture showing influences from the Saudi hinterland in the detailing of the arch. To put this in context, the iwaan would have looked similar to this example, part of one of the buildings in the palace complex built for Sheikh Abdullah bin Jassim at Salata, this photograph being taken in February 1972, prior to the reconstruction of the complex as the Qatar National Museum. Generally my intention has been to write only about the architecture of Qatar, but I thought it might be useful to place a few photographs taken in the Bastakiya area of Dubai on this page as there are some interesting examples of naqsh plasterwork to be seen there. More particularly, they differ in character from the naqsh work in Qatar though there are evident similarities. This first pair of photographs, taken of carved panels on the first floor of a building in the Bastakiya area of Dubai, show the wilful damage caused in the nine years between them. Apart from that it is interesting to look at the way in which the naqsh panels have been located with respect to the structure, the plain panels above and behind them supported by short shandal poles resting on the columns. The panels are probably around the same age as those on the Wakra and Doha buildings but are more refined in their craftsmanship. The patterns are more accurately drawn and executed, the openings larger than in Qatar and the right hand panel is of an unusual design compared with those common in Qatar. Despite what I wrote in the paragraph above, it is evident that there were eccentricities of design being made in Dubai as well as in Qatar. The right hand panel looks as if the craftsman ran out of patience when carving it, the lower area of the surround having been left visually irregularly balanced; a curious decision. The left hand panel has similarities with the right hand panel on the photograph above in that each panel has two design elements within it, neither having a proper geometric relationship with the other. But one of the interesting differences between Qatar and Dubai is the use in the latter of panels with cursive or even representational designs in them. This naqsh panel, for instance, has been carved both in blind relief on the right and above the door as a naqoush mefat’ha panel. There are two points to make, firstly that the carving through has been limited to the shape of the design and, secondly, that there is little or no decorative carving within the basic shapes which leaves relatively large unadorned areas of the pattern. This photograph shows, on the left, a naqoush mefat’ha panel in the same wall as that above, the panel being below the blind panel on the right. Note that the panel is significantly different from the similar panel that is on the left of the photograph above, and that it is a relatively representational illustration of a potted plant. Also note that similar carved naqoush mefat’ha has been used to create the balustrading to the first floor parapet on the right. There is another, similar, parapet design from Dubai shown on the next page, and also photographed in the Bastakiya in Dubai in April 1975. It is evident that there was less concern for privacy on the roofs of these buildings than was the case in Qatar. 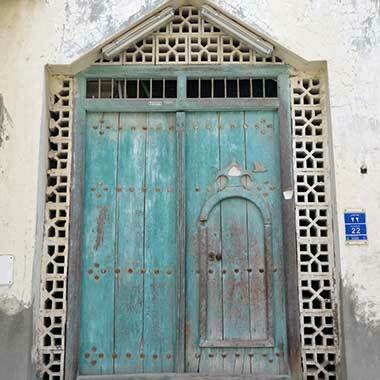 While this example of ventilation around an entrance doorway has not been constructed of naqsh as have been most of the other examples above, it is evidently a more recent construction designed to provide a novel and permanent ventilation solution surrounding the old entrance door of this building. From the lack of symmetry in the elements of the doorway it appears that the opening was there first, and the wooden door and surrounding concrete units were fitted later, the blocks on the left being cut to adapt to the width of the opening. It is difficult to understand how strong this construction would be compared with fitting a wooden frame directly into a solid masonry wall, but it would seem that the need for improved ventilation was more important than security. Most, if not all traditional doorways, have ventilation provided as a standard, usually by the incorporation of an opening above the solid door protected by wrought iron bars, as is shown in this example. There is also the tradition of re-using timber doors due to the cost of what were, once, their expensive materials. Here, however, is a development of the principle where pre-cast concrete units, more commonly used as external mushrabiya in screens, have been used to create a significantly enhanced and decorative ventilation area around the door. There are more notes on naqsh plasterwork on page 5 of the Gulf architecture section of these notes. As described above, the development of housing in increasingly closer proximity to each other created difficulties for the leading of fresh or cooling breezes into buildings. While Doha had a single burj al-hawwa bringing breezes into its related compound, other properties developed first floor accommodation to provide spaces for living in privacy, and served by cooling air movements. Photographed in 1972, this development to the west of the centre of the suq gives an indication of the scale of some of these taller developments, and shows how the ground floor was treated as window-less but with, on the first floor, both large window openings as well as badgheer elements. These elements introduced a degree of comfort for the residents of the building. Unfortunately, the buildings on the other side of the sikka had disappeared before this photograph was taken, but an indication of the need for ventilation can be readily imagined. While the ground floor rooms of buildings in the central area were ventilated essentially from the courtyard, the upper floors were more easily ventilated. When the weather was too hot to sleep in the ground floor rooms, families took to the roof. Here ventilation was provided by badgheer constructions or, in the case of the first floor rooms, by the window openings, partially protected by the wooden shutters if there was a privacy concern. But these were not the only methods used. This particular example was built to the west of Doha’s central suq and in many respects is different from the traditional architecture of the peninsula. Nevertheless, the intent seems to have been to replicate the needs for ventilation while providing privacy to the residents. The rear part of the construction is closed but has both high level openings to provide ventilation as well as badgheer openings at a lower level. The external balcony is enclosed to head height with, apparently, naqsh screens at the higher level, above small openings whose purpose might have been to provide views down to the street below. They are not gutters as there are maraazim set in below them. At some stage the naqsh screens and associated wall has been demolished and traditional shuttered windows inserted. To some extent this reminds me of the provision of summer and winter rooms in traditional Egyptian and Iraqi architecture. Not all screening was effected with perforated naqsh or permanent construction devices. In this example, photographed within Doha’s inner ring in 1974, there is both naqsh screening to create a reduced level of privacy on the roof – the screening is relatively low – but the verandah is protected by a timber screen. This was a relatively modern development at that time, most probably constructed towards the end of the 1960s. At first sight, this screened balcony appears to be very similar if not the same as the following example. Photographed in 1976, the screening is notable as the blades of the timber screen point up and not down. This accomplishes two purposes: on the one hand it gives complete privacy from anybody looking from the street below, or even horizontally and, secondly, even though the blades are constructed from a dark timber, they will help to direct light inwards towards the room behind. Photographed ten years or so later, in 1981, this timber screen was added to an older building. On the right a traditional badgheer can be seen, such a device ventilating a verandah corridor being relatively unusual in traditional architecture. Here the timber screening runs from above head height to the floor level, and has been provided with a small opening to give the ability to see activity on the ground outside better than can be glimpsed through the blades of the shutters. At first glance it appears that this old structure, photographed over thirty years later, in 2013, continues to enjoy the benefits of timber screening to its first floor. However, looking closely it is apparent that the residents occupying the upper level of the building – most probably foreign workers – appear to have added boarding inside the screen, preventing the free flow of air at the level of the screening. It is also interesting to note that the shutters of the screen are slanted down and inwards, a design practice that directs not only light into the building, but also rain. At the other side of the building – viewed here – the screening detail continues with, apparently, the same closing of the screening by the use of boards or panels and, in the last two or three bays, the screening carried up to the corrugated iron roofing. Although the screening of the building in this way appears no longer to fulfil its intended function, this design feature contributes to the traditional character of Qatar’s architectural vocabulary, and it will be a pity to see it disappear, as is likely. Here is another similar balcony screen, but is not effective as those shown immediately above. As can be seen in the photograph it is possible to see through it to anybody on the balcony. Here the construction of the timber screens is simpler. Instead of being formed of timber blades directed up or down and within a timber frame, here the screening is formed of timber laths set diagonally and at right angles to each other. To the best of my knowledge, there was only a single bridge construction within the residential areas of the suq, or elsewhere for that matter. A timber construction is the obvious solution to the structural issues involved, and here the link can be seen to be screened with timber. Unusually, the need for screening has seen the owner use what appear to be boards taken from packing cases. As the owner was one of the merchants in the suq it is not surprising that this route to privacy was taken, there being apparently no need to have sight on those passing below, nor of providing ventilation. Although the tops of buildings in the towns beside the sea were usually kept plain and undecorated, with time and wealth the tops of walls – where there was no badgheer – were developed with what might be considered an artistic device, the shurfa. At its simplest this was limited to the raising of the corners by the addition of, generally, quadrant rounded mouldings which relieved the horizontal line and gave the effect of entasis to a potentially visible drooping corner. At present I can not find the image I have but this corner, of a development reconstructed at Rayyan in 1976, illustrates the principle of reinforcing the corner literally and visually. On larger buildings and towers crenellation with a saw-tooth device were introduced giving a combed outline to the top of the buildings. Some people consider this to have evolved from the need for defensive fortification but, where fortified buildings still stand at Umm Salal Muhammad, Wajbah and al-Zubara and al-Athba in the north, this was not always the case, the fortifications generally relying on ’ayyin – holes in the wall for the insertion of rifles, or fetha al murakaba – observation holes in defensible buildings, though in this example, seen on the top of one of the towers at Umm Salal Muhammad, there are both. It is evident that there are more ’ayyin than are needed, so this may be considered an extension of a defensive requirement to decorative treatment. A more fanciful variation of this explanation is that the crenellations were constructed in order to make sure that there was no place for djin – evil spirits – to settle. In this example, photographed at Wakra in 1987, there are two types of shurfa used to finish off walls and roof. It is certainly true that the Arabs of the Gulf have demonstrated a traditional concern for spirits of this type and there is still a concern that owls – potent symbols of bad luck – should not be associated with, or settle on buildings. But it is more probable that crenellating the top of buildings was an aesthetic refinement developed by the master builders for two reasons. Firstly, there are not all that many opportunities for decoration afforded by the construction and material of traditional Gulf buildings, and the roof lines would have presented a large potential opportunity upon which to demonstrate some form of skill, if not artistic licence. This is supported by the name for this device, shurfa which is derived from the verb ‘to enoble and confer distinction’. Secondly and, I believe, just as important, the skyline of a building can be seen to meet the blue sky in a direct and abrupt manner. When the skyline of a building is crenellated the sky and building form a combed interface which is more restful to the eye and aesthetically satisfying than a straight, hard line. although the translation of Fathy incorrectly has this as ‘believers’ being equal. The example of crenellation immediately above was on an old building that has since been demolished. The example shown here is a modern reproduction accurately copying the traditional shurfa detail and more accurately represents the argument I have made in the preceding paragraph. At a distance this detail can be seen to soften the visual interface of sky and building; but there is an added interest here. Somebody as fixed a horizontal wire which, at this distance, goes some way to destroying the effect of the traditional detail above it, hardening the effect. Compare this photograph with that above it to see the effect the wire has. At its simplest it can be thought that there are broadly two types of shurfa: those that are symmetrical and mirrored about a central horizontal axis – as can be seen in the three examples above, and those that are asymmetrical about the horizontal axis and may be thought to have been designed as developments of ’ayyin, as in this and the next two examples. More examples of the shurfa can be seen on buildings all around the peninsula. Some designs are associated with the roofs of residential structures, as are illustrated above, while others are used to finish boundary walls. Often this produces quite different treatments as can be seen in the example above of the modern construction at Wakra which appears to be purely decorative while providing the softening of the visual interface between sky and wall as discussed above. The shurfa in this example is found on the top of the defensive corner towers of the old fort at al-Wajbah, though not along the tops of the adjoining walls which are just provided with ’ayyin from the firing step. It is evident that the design takes account of the need to provide a degree of protection for people within the fort allowing guns to protrude either through the shurfa or from the ’ayyin below. Apart from the above form of decorative treatment the most common decoration on buildings both in coastal settlements and, more rarely, in the desert, was naqsh plaster carving. 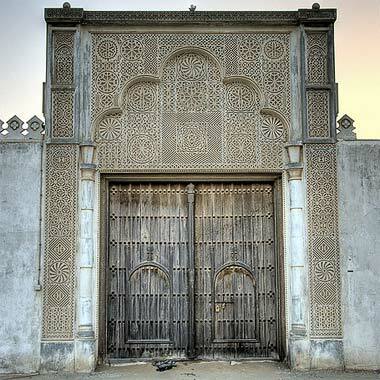 This first photograph is of a partially restored old palace where the entrance gate has been magnificently and extensively covered in naqsh carving. This degree of carving would only be executed under relatively stable conditions and, in this gateway, suggests to me a more complete coverage than would have been the case originally. In keeping with the rules that govern traditional carving, the naqsh work has been set out symmetrically about the centre. Within a majaalis this translates into the work being mirrored on both sides of the room though not necessarily about the centre of each side as this photograph illustrates. Also note the character of the decorative columns which do not reflect anything of the traditional architecture of the region in their detailing. The first photograph, above, shows the entrance gate as it appeared in 2007, the work on renovation and related decoration having been carried out in 1976 when the second photograph was taken. It is not possible to say, at this distance in time, how much decoration the original gate had, but it is unlikely to have been as much as is shown in these three photographs. The third photograph is the earliest of the three and shows work proceeding on the building I think was a majlis. The recessed naqsh work on the badgheer were an enhancement of the original work, which was undecorated, and it is significant that the maraazim are integrated into the decorative treatment and do not have an accidental relationship with it as often was the case. Considerable attention to detail went into the design of this work, reflecting the importance of its owner. Representational art is expressly forbidden in the Quran and, with the peninsula being under the sway of the wahhabi, geometric patterns were and are the rule. Very occasionally, as illustrated by this small bird tucked away in the corner of a newly decorated majlis, a touch of visual humour has been introduced, adding a degree of liveliness to the more formal geometric decoration. However, the normal geometric patterns were created with simple divider and ruler geometry and directly carved into wet plaster – the most lively and, usually, older forms showing distinct asymmetry due to the speed with which they were carved. On the simplest buildings the naqsh was related to the entrance door as could be seen at Wakra. In more developed form it was used as a series of panels around the doorways – naqoush suwr al bab. When there was more time and money available, the decoration was introduced within the niches created by the pier form of wall construction. It was either carved on site or the panels were carved on the ground and offered up when complete. These two photographs illustrate the difference in character between hand-carved panels and pre-cast work, albeit the photographs being of slightly different scales. This photograph is of a detail incorporated into an opening in a recently constructed mosque in Doha, and shows a typical modern interpretation based on the development of naqsh design established along strict geometric principles. The pattern is not as simple as it may appear at first glance as this form of geometric design encourages the eye to wander over it without establishing a real focus. This encourages reflection in the viewer. On further inspection it can be seen to be not only unlike traditional naqsh but obviously based on the type of Islamic designs more common in northern Islamic states than in Qatar. It does, however, have a resonance with traditional naqsh, even though it has no geometric similarity to the traditional Qatari form either in pattern or scale. 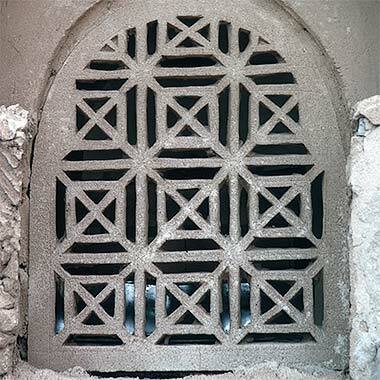 This perforated form of naqsh, in its traditional carved form, was used mainly in urban buildings within the peninsula where there was a need to bring air and, to some extent, light into the building and where privacy wasn’t of paramount importance or where there was no possibility of its being breached. It was also found, but more unusually, in rural buildings. You can see in the example immediately below and to the right that, when the same or similar pattern is constructed in a different material, in that case, on a precisely cut steel door, there is a very different feel to it, again less Qatari and more Islamic/Arabic. Qatari naqsh tended to be simple in concept and, usually, was created as an assembly of patterns rather than as a continuous repetitive treatment such as shown in this and the photograph above. Here is a photograph of another pre-cast panel, this time used as a screen to provide a degree of privacy in front of windows in a commercial building in the centre of Doha. Again based on twelve-point geometry, it is finer in its detailing than the example above, but also dissimilar from traditional Qatari naqsh work in its selection and character of geometry. What is not really evident from the photograph is that the pattern does not coincide geometrically with the pattern of the glazing behind it. When viewed through the windows from the interior of the building, this produces an unfortunate effect that could easily have been avoided with a little more thought. As an aside, it is also unclear how the outside face of the glass is cleaned due to the difficulty of gaining clear access. The two details in the photograph below demonstrate different approaches being used in Qatar. That on the left is a pre-cast concrete panel which, compared with the finer construction of the steel panel to its right, has more in keeping with traditional Qatari naqsh designs. The decoration on it is relatively typical of its sort, showing a fairly well developed pattern comprised of three main elements; the ground and two forms of six-point geometry. All three of them are found in naqsh panels in Qatar. The patterns are not integrated to the extent to which those on the right are. The pattern on the right is very different from that on the left. The panel is on a steel door and is a classic, twelve-point geometrical pattern, probably copied from an example in Egypt where this form of pattern was highly developed. 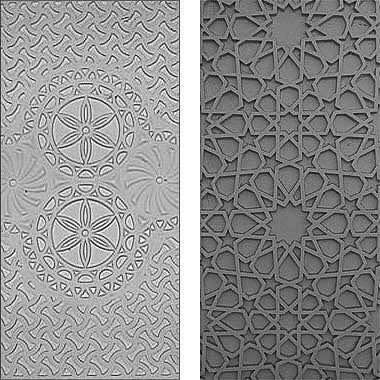 You can see how that on the left is very different from that on the right, much simpler and easily seen to be developed from the rapid carving of plaster as are the two below which are also pre-cast concrete. The main recipient of this form of carving was the majlis which, as the most important room established for receiving and entertaining guests, was the obvious place to demonstrate decoration. The panels were located above the windows either in a single band or, when the ceilings were high enough, in two bands. The particular rule in Qatar which applies in the location of these panels is that every panel along a wall within a room must be of a different design, although the pattern must be mirrored in the panel facing across the room. One small variation to this rule is that sometimes there is the evidence of the artist altering a single panel so that there is a degree of asymmetry within the room. The same principle is often to be found in traditional Persian carpets, the rationale being given that there can be no perfection in something only created by man. In the palace of the late Sheikh Hamad bin Abdullah in Rayyan, there is a beautiful little detail where a craftsman has carved a small, single, stylised bird on a panel in the south-east corner of the large majlis. The rooms of traditional buildings developed in response to two factors: the width was dependent upon the span of the mangrove pole danjal, and the height was related to a need to contain sufficient, cool night air to pass a comfortable day. This produced rooms with a narrow, high proportion quite unlike those we are used to in the West. In addition to the environmental benefit of having a high ceiling, there is a strong psychological rationale caused by the dislike of the badu who would be oppressed by low ceilings. I should make a final note on the use of pre-cast decoration. New residential development in the New District of Doha for the government Senior Staff has sites which are thirty-five metres square. The government was able to take advantage of pre-casting to produce standardised boundary wall units which has given considerable uniformity to the area and are considerably more attractive than the standard rendered and painted block and concrete walls which were used previously. The pre-cast panels are modelled in order to produce a more lively appearance and are mostly plain though there are some decorated with naqsh designs. You can see in the top photograph the three basic elements which make up the wall – the decorated panels, supporting columns, and the horizontal base unit to take up any irregularities in topography. The photo below is a detail of a pre-cast panel with a Doha Municipality logo on it. The Arabic reads ‘Doha City’. Doha Municipality has made a number of different pre-cast units in their attempts to improve the appearance of the urban scene. These four pre-cast units are part of a continuous barrier on the ‘C’ ring road and make an attractive grouping with a good sense of scale. I don’t know why the units are raised from the ground nor why the blocks which raise them are not of the same material but I suspect it may have to do with permitting dust and sand to pass under rather than pile up against the units. I would have preferred to see an more local geometric design to enliven them and it is sad that some organisation has stencilled the bottom of one of the units. But I think the main problem is likely to be in the casting. The second unit from the right show significant damage which I believe is due to the way in which it was made. The units are relatively thin and apparently not dense as moisture has been able to penetrate and create the damage. In the photo above of the Municipality logo you can see the surface crazing which characterises these pre-cast units. A heavier texture might have been the answer. I know that it is thought that a smooth finish will shed dust, but experience is that dust sticks to any kind of surface. There are more notes on the geometry behind screens on the two pages looking at geometry, with some discussion on the way in which geometric patterns are being modernised. But it is probably sensible to deal with those patterns in this area of the notes so that they can be compared with the more traditional patterns. The next two patterns have been placed here as they seem to represent a departure from the usual screens used in Qatar, are a move towards a more modern treatment of geometry, particularly in the second of the two examples, and contrast with the eighteenth type of geometric patterns immediately above. Both examples come from Abu Dhabi though I have seen something similar in Qatar. There are obvious similarities with the patterns created using Penrose geometry, but this example of patterning is placed here for two reasons. The first is that there seems to be a trend in at least Abu Dhabi, where this door was photographed, to develop a different character of patterns than is traditional in the area. The reason for this may be to do with the example which follows. The second reason is that the pattern appears to be a poorly observed copy of that below in that it has been been constructed using obvious repeats. I may be wrong but the lower example appears to avoid repetition. The new development at Masdar in Abu Dhabi uses a design vocabulary which differs in many respects from other projects not just there, but in other parts of the Gulf. This screen is a good example of this move away from traditional Gulf patterns towards a more modern interpretation of geometrically based designs. The panels are large, this first photograph showing only half the height of the screen and, like the door above, have been developed with squares and a rhombus with internal angles of 45° and 135°. It is not too easy to distinguish exactly how the panels have been fabricated, though they are probably aluminium, but there appears to be a single panel design, alternate panels being mirrored along a vertical axis, with the basic panel apparently designed with a random pattern. There is a similar screen in Qatar, shown on one of the Islamic urban design pages. This example was also seen in Abu Dhabi, this time at its airport. At first glance it seems very different due to its application on a different material rather than a screen, but the pattern is essentially different in that it is based on 60° geometry in comparison with the 45° geometry of the examples of the screen and door illustrated above it. The reason it is shown here is that the shapes created over the underlying geometry are often irregular, showing a disregard for patterns of regularity which are very much different conceptually from traditional ways of designing and laying out patterns. At the Masdar development in Abu Dhabi another way of setting out patterns has been used to screen windows, providing not only a degree of solar and light control, but also the privacy that is needed to mask windows in this part of the world. The screening is interesting on a number of levels. It has been developed from the same material as is used to create the external wall surface rather than as an infilling screen of a different materials, which is virtually always the case with traditional mushrabiya due to their traditional means of manufacture. This allows the screen to be led on a curve along the balcony. The effect of this is to create a more integrated wall surface than is usual, the screen element becoming a visually softer part of the wall. Again, the pattern is based on an underlying 45° geometry and appears to be random. Advantage has been taken of the material from which the screen has been formed to use lines and infill of differing widths to create a more complex pattern than is usual. It is an interesting development of modern screening. Finally a note on utilities, by which I mean the supply of light, water and sewerage to traditional buildings. I shall make more notes on this in a separate section. I don’t intend to deal in any detail with this provision for tented structures. It’s understood that water was obtained from a bi’r in the desert and there was no sewerage. Light and heating was provided in the first instance from fires which were fuelled from material found in the desert together with droppings from the tribe’s animals. Bear in mind that wood was too expensive to buy and use for fuel though charcolas was bought as a trade item. Food was cooked on the fire by the women of the family and, usually, coffee would have been provided from the same fire by one of the men of the family. Sometimes this would have been carried out on a separate fire on the male side of the tent compound, particularly likely when it was for guests. Where there was lighting, other than that provided by the fire, it would have been by means of paraffin lamps, the paraffin purchased in the nearest conurbation or from passing traffic. The coming of wealth to Qatar brought the means to obtain a better standard of living. Normal commercial forces, together with a generous State, encouraged people to upgrade their traditional houses. In urban areas septic tanks were the normal means of dealing with sewage from households, generally within the compound. This was not always the case, however as, sometimes the septic tank was located outside the compound as is illustrated in this photograph showing vertical drainage pipes leading from two first floor hamaamaat to the external septic tank or tanks in the outside road. Notice how the enclosure resembles the zuli used on traditional sailing craft. The State made considerable efforts to organise an effective drainage and sewerage system, bringing in consultants to advise the relevant departments in the Ministry of Public Works. With the beginnings of urban expansion there were many problems. Plans changed and, in the central area there were many houses left unprovided with mains sewerage for some time with the uncertainties of the character and density of the development planned and its layout. In the outer areas of Doha it was easier to deal with the new roads and associated housing, but changes were made nevertheless and infrastructure amended to suit. One of the characteristics of this form of uncoordinated development was the continual damage to roads and the uncompleted appearance of many areas of the city. Because of this, development within the New District of Doha was carried out with an integrated design for utilities, and coordinated in weekly meetings of the different departments and their consultants through the Office of H.H. The Amir. This system was then directed to operate within the existing areas of Doha, though this was extremely difficult to carry out compared with the New District which was, in actuality, a tabula rasa, the main difficulty there being in determining the electricity loads for the developments which, with rising income, were themselves increasing. Potable water – known as sweet water – was obtained from wells in the compound often relatively near the septic tanks, providing the possibility for cross-contamination. Compounding this was the problem of salination of the sweet water, particularly near the coast where the salt water table was relatively high and increased in concentration with sweet water abstraction. Here a water tanker stands adjacent to a domestic property and pumps water to a galvanised steel water tank on the roof. Incidentally, it is worth noting that there was a ready supply of potable water both under the ground as well as under the sea. The ancient civilisation of Dilmun was centred at nearby Bahrein – whose name means ‘two seas’ – and was so named from the belief that they were founded – both land and sea – on a sea of sweet water. A better quality of water was sold from donkey carts which travelled the streets loaded with the ubiquitous plastic containers or oil drums. This was obtained from privately controlled bi’r in the desert, but would not have been a large amount of water by the nature of the relatively small loads. The donkey cart was soon replaced by the water tanker. Traditionally, water was often stored in porous earthenware pots which, operating on the evaporative principle, kept the water relatively cool. In those days the water varied in quality and was not too safe to drink as well as containing a number of other items. I have seen water from such pots drunk through a ghutrah in order for the drinker to filter it. Hessian and other similar materials were also used to filter water prior to drinking. Eventually, a water distribution system was installed and extended to provide potable water to all houses, the water being a mixture of ‘sweet’ water and, once the first desalination plant had been built, desalinated water. In the beginnings, though, there were a number of difficulties relating to the design and installation of the piped distribution system. Rapid growth, forecasting, design standards, materials, the inaccuracy of contractors’ work, the sporadic pattern of development and a number of other factors created a range of problems that had to be dealt with by the Ministry staff and their consultants. This resulted in continuous difficulties for consumers wanting to be provided with a safe and adequate supply of potable water as well as with flooded areas when pipework was breached. As mentioned previously, there had always been a system of suppliers who moved around the furuwq delivering water from donkey carts. It rapidly became necessary to supplement this system as the greatly increased demand outstripped the Ministry’s capabilities to respond in the initial years. Water tankers became a common sight, pumping potable water to the galvanised steel water tanks located on the roofs of the new, and old, houses. In fact many people preferred this form of delivery as not only were there problems with adequate supply from water mains, but cross-contamination from sewerage pipework and septic tanks, due to negative pressures in the potable water system, increased the demand for tanker-borne deliveries. Water tankers such as that shown in the above photograph, taken in the 1980s, were a major feature of the urban scene for a number of years, similar tankers also supplying effluent treated water to landscaping, a system that required intervention and control from the Ministry of Municipal Affairs in order to regulate and safeguard both the public and their own workforce. There is an interesting point to make regarding the heating of water in houses. In the past water was drawn from the ground or was bought from a circulating tanker and stored inside the house where it was heated when needed. With development, galvanised steel water tanks were placed on the roofs of houses to provide a head of water to the new kitchen and sanitary appliances now located within the houses. Inside the house, water heaters were provided in kitchens and bathrooms, and these produced hot water during the colder months of the year. In summer, the sun heated the roof-top water tanks and the internal water heaters were turned off, the hot water taps providing cold water, and the cold water taps hot water. This system is still, to some extent, operating within the State though the more up-market housing relies on relatively cheap power to both cool and heat when necessary. Nevertheless, some owners shade their cold water systems on their roofs. This example is located on an old house and shows how a simple barasti shading device can be used to shade a water tank, or anything else for that matter. The material allows air to circulate through and around it while providing sufficient shade to keep a water tank relatively cool. Some may think it an unattractive solution but here, adjacent to landscaping elements, it does not seem out of place. I have mentioned elsewhere that it is a common failing of architects to consider roofscapes and the location of utilities in the design of their buildings, being apparently unaware of the ramifications of the latter’s additions at a later date. I certainly can’t remember when I last saw provision for utilities incorporated in design drawings on residential buildings. A further point to make on the water systems within all properties was the unsuitability of the materials used. The galvanised water tanks on the roofs rusted quickly along with the pipework. This created heavy brown sediments in old pipework which most people found, naturally, unpleasant due to both its colour and taste. In this photograph of pipework in a bathroom, evidence can be seen on the walls of the water quality when the steel pipework was replaced with copper. Galvanised water tanks were soon overtaken with fibreglass tanks, bringing with them different problems for house owners and being reflected in the character of the light industrial areas of Doha. As mentioned previously, lighting was originally by paraffin lanterns, the paraffin being bought again from a donkey cart loaded with drums. These carts could still be seen in Doha in the late seventies. One disadvantage of bringing fire into the house in this manner was the likelihood of fire. It was common to see soot-blackened walls and ceilings and, from time to time, the heat generated from the lights would cause a fire in the matting of the ceiling. Soon, the electricity system permitted a connection to a mains system, and this was taken up with alacrity. The early seventies saw public street lighting starting with the Rayyan Road, and this was rapidly moved out to provide a supply to the most important feriq s.
Within the house, wiring would be strung across walls usually with an unshaded bulb hanging from the end of it. This, too, was a hazard, but began the change in living habits of the inhabitants. For instance, schoolchildren could now study their books at night, and other tasks which required good light could be practised at night. Of course, power outlets were also provided – usually on the same circuit – and this permitted equipment to be bought and utilised by all members of the family. One interesting design point emerged from the manner in which modern utilities were incorporated into old buildings. A small number of traditional buildings were re-built on their existing sites for a variety of historical reasons. The work was carried out by a team of builders under the direction of a master builder. Although elements of the work were carried out to modern design standards – for instance, the incorporation of sewerage – the team were insistent that elements such as the orange ‘Pyro’ electrical cable should be face-fixed to the walls and not led in conduit, as this was the way in which the original buildings were developed. This gave the cables an unsightly prominence, but was a minor issue compared with elements such as wall mounted air-conditioners being incorporated in a similar manner to those which must have first being located in houses. Families traditionally cooked outside. The pots used for traditional meals tended to be very large – as they still are – in order to contain the meat required for traditional meals, particularly machbous, which is a style of cooking rather than the meal shown itself. The top photograph shows a meal of mutton on a bed of rice, both plain and saffron. The lower photograph shows another traditional meal of grilled fish, plain rice and different salads, the whole arrangement served on a sufra – usually a woven mat. Notice that the top photograph shows the meal appears to be served with a sheet of plastic under the tray. The lowest photograph shows a tray of puddings served, like the meals above it, on the carpet for those sitting there. Where the original fuel would be wood or charcoal, today it is gas which is run from cylinders. This is still preferred over electricity for the majority of cooking, other than for smaller requirements such as toast, Western coffee and the like. Elsewhere I shall deal with this subject in a little more detail. I said earlier that families cooked outside, but they also cooked inside as well. Obviously, when the weather was bad there would be pressure to move indoors but there seems to have been two areas involved. The first was the covered areas of the plot, the second, one of the internal rooms. The covered areas were a common place for a number of activities but were ideally suited to larger meals and the ability for the women to keep an eye on most of the activites of the family. When the family cooked inside it would usually be over a fire and often on a pot suspended by a rope tied to the centre of one of the roof beams. It was common to see soot staining to walls and ceilings both from fires as well as from lamps providing illumination. there may have been an element of displaying new acquisitions, something which was also to be seen in habits such as the reluctance to take shipping labels off new cars, keeping new furniture wrapped, and the setting out of furniture in rooms. This lack of thought still continues with new buildings so it is not surprising that there are difficulties with the incorporation of modern utilities in refurbished old buildings. Here is a photograph, taken on a new and expensively finished building, showing an exposed air conditioning unit next to a screen masking a small window. A similar screen might have been considered for the air-conditioning unit. As you can see, these two photographs were taken from the same photograph, but illustrate two points. The top photographs illustrate a very typical arrangement for air-conditioners where even relatively new developments – here a row of shops – have air-conditioning poorly integrated with their façades, in fact not integrated at all. This type of arrangement is very typical not just of shops but of residential areas which I have mentioned previously, and severely detracts from the comfort of the space immediately outside the shop. The only thing in their favour is that they are above the height at which they might be walked into. In order to ameliorate one of the main problems of this arrangement, the shopkeepers have located tins on the pavement in order to catch the condensate and stop it splashing onto the pavement and running away, thus creating a nuisance if not a hazard. But in doing so they have created another danger of walking into the tins, and which is also an ugly solution. I’ve included this photograph as it illustrates the most commonly seen treatment of building façades, particularly in its use of perforated naqsh or mushrabiya and the treatment of wall mounted air-conditioning units. Although there is no solar protection made to the windows there is a useful device of a small projecting rain hood above the windows to help shed water moving down the face of the building over the window. This is an important detail because the seals between window units and the window opening can not be relied upon. There are two other issues to note in this photograph. The first is the common problem seen all over the State, that of unprotected air-conditioning units. Many architects neither see them as an element to be treated both architecturally as well as environmentally, protecting the unit from the sun and rain as well as treating it aesthetically. The second point to note is the the lack of consideration for treating and protecting – in a similar manner to the air-conditioning units – the water tanks on the roof. Architects’ drawings never show them and most seem unaware that something can and should be done about them. While I’m about it, I should add this photo taken in one of the older areas of Doha. Television has always been popular in Qatar and every house used to have at least one aerial to pick up whatever was available from inside and outside the country. But there has been little control on it and, in some areas of the country the result is a mess of aerials and cables. The photograph also illustrates a little bit of local design where an owner has added dentate crenellation to the top of his parapet. I have written earlier on this page about the possible origin of this detail, and it is interesting to see it here in a situation where it is not needed but can only be a design feature. Having said that I have to admit it looks attractive to me in the way it combs into the sky, and has a resonance in the traditional architecture of Qatar. Here we see the common treatment and use of domestic roofs. The water tanks are fibreglass nowadays. These tanks used to be constructed of galvanised steel and were the source of brown water from their rusting. There are still problems with steel being introduced into water systems but it is increasingly rare in new buildings. You will see that there is no solar protection to the water tank. This can be a bonus. It used to be the practice to obtain hot water from the solar-heated water tank in summer, cold water being drawn from the internal hot water tanks where it had time to cool. There are two other things to note on the roof. Firstly, steel starter bars are often included as a mark of faith in changing planning regulations in the hope that another storey or more might be added to the structure at a later date. Some of these starter bars are not continuations of the columns below but short steel cages hammered into the drying concrete as the roof is constructed. Secondly, there is little or no waterproof treatment of the roof other than a coat of a proprietary material which, more often than not, permits water ingress with time. Returning to air-conditioning, separate units were and still are preferred as they are less expensive than split or central systems. Curiously, it is not unusual to see houses which have both central systems as well as split or wall-mounted units, for reasons I don’t want to go into here. This may not be the right place to put this photograph but it might be useful here as it shows the inside view of a wall-mounted air-conditioning unit. Not just that, it illustrates a very common standard of location, attention to detail, the surrounding wooden trim, and the location and quality of the attendant, necessary, electrical socket outlet and connecting wiring. This is not uncommon. Here is another photograph taken in the wind tower house, showing the installation of an air-conditioning unit in a traditional building. The electrical wiring is in and has been painted white, but the condensate hose has yet to be fitted and led outside. It is also notable that there appears to be a blanking plate, presumably hiding a lighting point to which cable has been led, on the face of the column on the right. Whether to hide cabling or not has always been a source of fierce debate. Here they seem to have both systems. it is not possible to use traditional air-conditioning systems as they rely on an occupant tuning the building constantly dependent upon prevailing weather conditions. So, now these buildings are preserved for those who may never have seen the kinds of building their parents were brought up in, but in a manner which doesn’t reflect the original conditions. I suppose it can be argued that there is a distinction between the traditional building in its construction and fitting out, and modern additions to it – the air-conditioning, lighting and provision of water. My own view is that they should be kept in their original condition, kerosene lamps and all. Although I complained earlier about the lack of consideration for the screening of utilities, there are signs of change. Here, a café near the sea on Al Khalifat has air-conditioning units screened by a design based on traditional naqsh carving, though the pipework is still exposed. Their incorporation into the design of the building and its landscaping is questionable, but at least it’s a step in the right direction. I don’t intend to write much here about modern construction other than to give a brief description of the basic materials and methods used throughout the country. The main reason for this is because, except for a handful of projects which use pre-cast units fabricated on- or off-site, the same materials are common to all projects. However, as you can see from this photograph, times are changing and construction methods have had to change. I intend to write more about this later. Reinforced or mass concrete, concrete blocks and cement mortar are the major building materials in Qatar as they are in many parts of the world. The only differentiation between projects is quality control and this, to a large extent, depends on the character and quality of the workforce and their supervisors, and the knowledge and expectations of the client. The most prestigious project in terms of concrete and its control was, probably, the Gulf University, constructed at the north end of the New District of Doha. International companies of contractors and engineers were responsible for the detailed design and construction of the unusual project. Similar high standards were used on the five hundred bed hotel on the point of the New District of Doha where pre-cast units, manufactured on site were hung on a steel frame erected as a design/build project by foreign contractors. Although foreign contractors came into Qatar to carry out projects, there were significant efforts made for skills transfer in order that the local contractors could build up their expertise and become dependent. Today there are significant numbers of contractors operating at all scales of construction. Ownership of the construction companies is in the hands of nationals but, by and large, the day-to-day running, project management and workforce are all ex-patriate. Consequently the standard of work varies enormously with no real advances being made in design or techniques. These four photographs illustrate the character of three different scales of development in Qatar. As is the case all over the world, the workmanship that goes into any scale of project can differ widely, independent of that scale. Small is not necessarily going to produce a poor result, and vice versa, though it is a truism that the larger companies tend to be better organised now than they were, and this might produce better quality work. The small project at the top right illustrates the use of formwork to create concrete column, barrel vault and arch features designed by the architect. Concrete blocks for walls and columns require no great skill in constructing though the applied marble cladding needs to be placed by a skilled mason. The site is not as tidy as it might be but it does reflect the character of small scale construction in Qatar. The second photograph was taken of a multi-storey structure in the centre of Doha which used a combination of in-situ concrete work combined with pre-cast concrete floor planks and concrete blockwork. The work appeared to be relatively neat and accurately set out. There was some leakage between formwork joints, a problem particularly in hot climates, but the site looked organised and tidy, usually a sign which translates into good workmanship. The third and fourth photographs are here to illustrate the scale and character of some of the developments under way in Qatar. They were taken on the New District of Doha and, while not unusual for a developing country, show a considerably greater scale of building activity than would have been the case ten years ago. If you look around the urban design pages you will see more of this activity in and around the capital. The upper of these two photographs shows, among other things, the character of the sub-soil conditions obtaining in the New District of Doha, an area reclaimed from the sea in the nineteen-seventies. Note the length of the piles. The lower photograph illustrates the character of some of the new architecture being constructed there with the City Mall on the right, one of the largest commercial developments in Qatar. Construction can be a dangerous activity. Many believe this to relate to mechanical problems – construction workers being hurt by materials, processes, the accidental movement of vehicles and equipment, or by their tools – all this more likely if the working areas are dark or untidy, and if they are tired. It is certainly true that construction sites are dangerous places and they and workers need significant safety controls if workers are to be able to work in relative safety. But these two photographs, taken in November 2005 and May 2006 respectively, illustrate the danger of fire. The Al Nasr twin towers have suffered fire twice now, the second occurence affecting both towers. I understand none of the construction workers was hurt though a number of fire-fighters were. Qatar’s press believes that the state’s fire-fighting capabilities have not been able to keep in step with the rapid increases of the construction industry. This third photograph shows the top of one of the towers some time after the fire was put out. Fire, apart from the obvious danger to those working on the building, can dramatically affect materials and their fixings. Often elements of the building must be taken off and replaced as the fire not only damages elements of the building, some of them hidden in ducts, but compromises both the integrity of fixings as well as the capability of completing associated works. Here you can see the smoke-blackened exterior, but you can’t smell it. The damage caused by smoke, even in small quantities, can take a long time to clear away. In a building which has not been fitted out this may not be so difficult, but is made considerably more of a problem when there are any soft furnishings. It is also extremely more expensive and usually requires throwing away anything into which the smoke has worked its way. This problem is common all over the world and shows how dangerous sites can be even though buildings appear to be constructed out of fire-proof materials. While the materials of construction might well not be inflammable, there are always flammable materials lying around and with heat producing processes in operation. With no compartmenting of the building in place, fires can escalate rapidly. In many ways buildings under construction can be more dangerous to those within them than finished buildings. Nowadays there is significant interest in the problems of assuring safety in the event of fire during construction, something more difficult to design than with a completed building. However, with poor controls and practices allowing materials to be assembled in dangerous juxtaposition, it is not surprising that fires happen. Having said that, most deaths and injuries on construction sites are not due to fire. I intend to write about the issues relating to fire safety associated with buildings in use elsewhere but it is interesting that, in Dubai, there are the beginnings of a concerted attempt to make occupied buildings more safe. While this relates to buildings which are held to be particularly important, safety measures which include pinpointing horizontal and vertical positioning within the building for fire-fighters is an obvious necessity. I should also point out that this seems to apply to completed and occupied buildings, not necessarily those under construction. Lives, property and assets are valuable, as are the operations which drive the activities within buildings. Business continuity is only assured through the safety in use of buildings. The most significant problem with the materials used seems to be related to the aggregate. Qatar is a limestone peninsula and the aggregate is, of course, limestone. Regrettably the local limestone is relatively soft and deteriorates relatively rapidly when wet. Although it is an extreme example, the photograph here is of one of the pre-cast bench units on the Corniche where the aggressive sea action has badly damaged the surface of the unit. The material to the right, on which the units are set, are gabions – wire baskets filled with rocks, used to form a relatively stable base for further construction. This requires aggregate to be properly protected within its concrete mix, which implies very careful selection, mix and testing. This is not always the case. The situation where the problem seems to be most commonly seen is on pre-cast concrete kerb units. This photograph shows the original design of the Corniche sea wall. The top of the wall is set at sitting height so that the public can sit on it facing either direction, the design is robust and in keeping with its marine location and, extremely importantly, so that the horizon could be seen without being interrupted by the railings originally mooted. The taller buildings in Qatar, particularly those located in the New District of Doha need substantial foundations to transmit the loads placed on them. I believe that both bearing and friction pile systems have been employed depending on the loads and local conditions. Here a worker levels off the top of a pile which has been cast with considerable steel in it. It is interesting to note that the steel is relatively clean, a practice that has not always been followed. Steelwork is not always properly prepared, a necessary procedure due to the high humid, maritime climate. In fact there used to be a theory held by some contractors that rusted steel gave the concrete a better grip. I don’t know how well times have changed but I have also seen steel starter bars – the steel bars sticking out of the floor of a slab, and from which the next storey columns are cast – being hammered in from the top by workers, rather than being a continuation of the column reinforcement below. The placing of steelwork reinforcement is always problematic. Not only is it often to be seen trodden down to the bottom of the formwork, there are many instances of it being taken through into balcony areas at the same level as it is set for the adjacent floor, rather than being moved to the top of the slab as is necessary for a cantilevered slab. This can be seen in many areas where rusted steel can be seen exposed on the soffit of balconies. Not only is spalling concrete dangerous to anything or anybody on whom it falls, but the weakening of the balcony has the potential for the whole balcony to fail. Formwork for concrete is often of poor quality on small- and middle-range jobs. As I wrote earlier, it doesn’t follow that small projects are badly constructed; it all depends on the supervision. Concrete poured into loose formwork tends to leak the fines – mostly cement and water – which weakens the mix and produces concrete of uneven strength. Allied to this problem is the difficulty of curing concrete slowly in a very hot climate, again something which seems rarely to happen. Having complained about the quality of the concrete generally, I have to say that the finishing of many projects can be of extremely high quality. Marble cladding, tiling, cabinetry, gypsum plasterwork and the like are often beautifully finished. This photograph gives a glimpse of a gypsum ceiling being constructed inside a house, as well as a view of the way in which the window opening is being lined with marble. The stone cladding with contrasting quoins add texture. Which reminds me that all buildings become covered in a fine coating of dust from the desert winds. White walls tend to show this up whereas a colour and texture such as on this building will hide it well and reduce maintenance. And here is a building under demolition. In this photograph of one of the first floor rooms you can clearly see the cross-section of the fibrous plaster ceiling and its supporting sub-structures. Incidentally, you can also see the curious amalgam of design styles, a cross between Western and Arabic, but perhaps more of the former that was, and is, a feature of many house interiors. It is also evident that the plenum behind the ceiling appears not to have been used for air-conditioning and that wall-mounted units were used, the frame for one of them just visible behind the column in the far right corner of the room. into which a number of countries have formulated legislation and codes with a view to improving safety on sites generally, and particularly with reducing the numbers of people injured or killed there. Safety hazards include, but are not limited to falls from height, crushing, being struck by falling objects, electrocution, fire, and contact with motorised vehicles, machinery and equipment. Health hazards include, but are not limited to the impact of, or contact with noise, materials such as lead and asbestos, paints, solvents and aggressive materials, and manual handling activities. Health and safety applies not only to those working on sites but to those moving around off site and, in a general sense, applies to protecting the public from the processes involved in site construction, on and off site. A number of factors create or combine to produce conditions under which construction site staff may be at risk. So it is reasonable to require that those on site should be fit and healthy, rested and not tired, trained for both the duties they have to perform as well as having at least a general understanding of the processes and procedures of the sites on which they work. In the Gulf generally, there is concern continually reported in the local press that this is not understood and that workers do not have the resources they need both in terms of equipment and training, but also in terms of their being fit for work. Construction workers need to be protected, often from their own carelessness. Sites need to be kept clean and tidy at all times, workers need to wear protective clothing sufficient to enable them to work properly while protected against common problems. Helmets and reinforced boots are now commonly available on many sites, but high visibility tabards, protective goggles, ear defenders, and breathing equipment for certain activities or locations must be available and, where necessary, worn. Just as important, the number of hours worked, in whole and at a time, needs to be carefully monitored, workers need to be fed and watered regularly and generally looked after in order for them to operate to their optimal capacity. All this is slowly becoming a part of working practice in Qatar but there remain dramatic differences in the application of site safety practices due to a number of factors. One of these is the sheer amount of work being carried out and the speed that is being demanded on building sites. But there are also difficulties persuading both workers and their managers that there are good reasons for working safely. It has been suggested to me that there is a degree of fatalism in workers that argues they are not fully in command of their own safety and so don’t have to worry too much. Combined with this there is also a degree of machismo among construction workers that militates against their behaving sensibly and, to a degree, ensuring the safety of others. These first three photographs show workers operating above grade with no protection to prevent their falling. On the cantilevered staging, the boards are loose laid and only one of the men in the two photographs is wearing a hard hat and none are wearing overalls. In the lowest of the three photographs the workers are balancing on two blocks and operating six floors up at an unprotected opening. This is replicated in the next two photographs. None of the men is wearing a hard hat, though it appears that the men in the first photograph are all wearing protective boots. These photographs illustrate a common attitude to work which can be seen all round Doha on the larger sites, though far more dangerous practices can be seen on smaller sites where workers are not properly equipped or, when they are, choose not to use their equipment properly. Much of these problems can be countered by proper supervision, but it seems not to happen. Those in charge of safety on Western sites will tell you that safety values, or lack of them, tend to operate as a whole across individual sites. They stem from a combination of management intent and experienced foremen ensuring standards are met and practices followed. One of the easy ways to judge a site is by its cleanliness. This site, for instance appears to be a hazard not only to its workers but to anybody passing or moving around the periphery of the site. There is a rudimentary protection at the opening but most of the rest of the building lacked even this at the open edges of floors above grade. There was also, at ground level, a massive pile of masonry and timber with material being added to it by being thrown off the building with no regard for passers-by, coincidentally creating a secondary problem for sorting and clearing away. The photographs shown here were not taken to demonstrate specific problems and seem generally representative of what is happening around the country. In many respects, particularly on smaller sites, there seems to have been little progress in attitudes to working in sites. Commonly, workers avoid wearing hard hats as they feel safer without them, and certainly more comfortable, particularly in hot weather. Where hard hats are worn, many wear them in a stylish manner rather than properly sized and secured to the head. In addition to which, many workers prefer to wear flip-flops rather than protective boots. Some say it is because the site doesn’t provide them; some say that it is a question of the worker having to pay for them, a cost they can’t afford. I don’t know the extent to which either is true. Since the early nineteen seventies there has been an interest in Qatar in preserving something of the built past. The first notable effort, and a development of some scale, was the conversion of the old Amiri Palace on feriq al Salata into the Qatar National Museum. This was a relatively successful development involving both preservation, reconstruction and the insertion of a new building into the complex, though a number of buildings were demolished in the process, and the footprint of the original development lost. Regrettably the manner in which this initiative was carried out did not act as a guide to the preservation of other buildings in Qatar other than the Qatar National Development Museum immediately adjacent to the Grand Mosque in the nineteen eighties, two historic buildings as part of the new Diwan al Amiri complex completed in the nineteen nineties, and the wind tower house in the centre of Doha and completed around the same time. Work has also been carried out latterly on the fort in the north of the country at al-Zubara as well as the fortified buildings at Umm Salal Muhammad. The former appears to have been carried out accurately, though I am not sure about the latter. I have written about these and the redevelopment of suq waqf elsewhere as they appear to have been dealt with differently, particularly the latter. It is evident that there are a number of different approaches being taken with regard to consolidating the architectural heritage. Perhaps the original lack of interest in preserving the past was due to a primary focus on constructing new buildings on a modern infrastructure. To be fair it appears that the importance of the past has now been recognised and attempts are being made to re-create something of it both in buildings as well as other areas such as dance, music and the arts. But these are not easy policies to follow. They can easily lead to pastiche supplanting reality in a recreation of the past and, worse, the creation of a past that never existed. Bearing in mind the policies aimed at developing tourism, the manner in which old buildings are dealt with must be extremely carefully considered if parts of the built environment are not going to resemble a theme park. Sadly, it is notable from the Internet that many of the tourists moving in and around suq waqf believe they are in an authentic environment, perhaps tidied up in places. These photographs might illustrate something of the difficulties experienced when reconstructing old buildings in a previous architectural style. I have mentioned elsewhere that suq waqf has been reconstructed in a slightly different style from its original architecture, and the difficulties there are in avoiding the creation of a theme park style architecture. Efforts have been made in the suq to avoid this by using different styles of scale and finish, nevertheless problems remain. Here the old building has been constructed with, among other elements, protruding danjal. In the past buildings were constructed from materials readily to hand, stones from the desert, juss and nuwra, both relatively easily acquired. The most expensive material used was timber, both that used for roof construction as well as for doors and windows. For this reason most timber was re-used which accounts for danjal being often of irregular lengths as it would have been an expensive mistake to trim a danjal, reducing its value, and find you needed a longer one later. Bear in mind that traditional constructions had to be maintained every year and that a building might be considered to have a thirty-year life with reasonable maintance. The danjal shown in this photo are smaller and closer together than they would have been in the original buildings and theoretically illustrate the relatively lack of wealth of the owner of the building. The new shutters, however, are a quite different matter and illustrate considerable wealth. It is in areas of contradiction such as this that pastiche has some of its difficulties. Note that few of the original buildings were the height of this building, but were mostly one and two storeys. These two photographs – the second a detail of the first, and taken in August 2008 – show the top storeys of another building in suq waqf. There are two points to make here. First, the manner in which the structure has been articulated is disappointing. In all the old buildings I have seen, I cannot recall seeing a structural framework which was discontinuous vertically, as can be seen here. In traditional architecture the columnar elements are taken straight down with no lateral offsets. In this way the structural forces within the structure – in this case, the walls – are brought straight down, reducing the possibilities for damage to develop within the structure due to uneven stresses. The second detail which is not seen in the traditional architecture of the peninsula is that relating to the location of the maraazim with regard to the columns supporting the horizontal badgheer. Although it might appear to be counterintuitive, traditional practice is to locate a mirzam within the structural column rather than between them as shown here. My understanding is that the column is used to anchor the mirzam soundly. While this may be effected equally well between the columns, it just doesn’t look right. Here you can see a little more of the method of reconstruction of one of these new old buildings. It appears from the colour of the matrix that it may be that juss is being used to hold the stones together, and not cement. Timber centring is being used to create the arches on the left but you can see that horizontal concrete beams have been introduced in place of the mangrove poles which, like the danjal, formed the basis for horizontal elements in traditional buildings. So, here you have pastiche with different materials being used to produce the different effects needed to mimic a traditional building. Repairing traditional buildings and re-creating the form of traditional buildings may be argued to suggest or require different forms of construction. But if the resulting form is to give the appearance of traditional architecture, then it seems correct to provide it accurately otherwise the visitor will not be able to enjoy the full experience of this form of architecture. The danger is that it will be debased and, in this, the visitor will see both the architecture and its wider setting, Qatar, as less than genuine. but it has to be borne in mind that not only do these treatments overlap, the saving or redevelopment of a structure might include differing proportions of these treatments. More important, it has also to be remembered that not only is the reconstruction of buildings subject to fashion, but the meaning, policies and detailing of conservation, restoration and reconstruction also vary with time. Conservation, at its basic level, relates to the treatment of buildings and their associated fittings and finishes that are in a vulnerable state. The main thrust of the policies will be to prolong the life of the building and will include, but not be limited to, treatments that include preventative, technical and environmental measures as well as policies relating to the preservation of the elements of the building. Preservation and conservation are not the same thing and need to be distinguished when formulating plans for dealing with the building. Identification of the treatments necessary for preserving the building depend on analysis and interpretation. These will identify the dating and provenance of the architectural elements of the building, leading to an understanding of the structural and material performance of the fabric. The aim of this work is to avoid loss or damage and to identify treatments for the sympathetic and appropriate preservation of the elements of the building. The thrust of conservation is to prevent deterioration while preserving buildings for future generations. By contrast with the principles of conservation, restoration deals with the rehabilitation of a building to something approaching its original state. With many buildings, it is likely to incorporate a significant amount of conservation in order to protect and safeguard the building, the restoration activity being applied to elements of the building which are no longer present, have been incorrectly replaced or are in a parlous state of repair. filling lacunae so the intervention is recognisable at close range but not from a distance. As I wrote earlier, this subject is very much dependent upon taste and fashion and has changed dramatically over time. It seems to me that Qatar is entering upon this in a comparable manner to that which obtained in the West some time ago. In this I am referring to the tendency to confuse restoration with reconstruction and the loss of information relating to the original buildings. use improvements such as access for the disabled. some of which are inter-related and need to be considered carefully with regard to the specific requirements of each building and its intended use. Reconstruction is thought by many to be the same as restoration or even conservation. Plainly it isn’t, but it does indicate the relatively new concept that restoration appears to represent within the peninsula. In this photograph of work on the central building in Sheikh Abdullah’s complex on feriq al-Salata, taken in March 1972, there is a mixture of restoration, reconstruction and, even, some refurbishment being carried out, the principle at that time being to recreate accurately the original building. Many of the old buildings that have been selected for saving have not been maintained for so long that they are, or were, in a dangerous state. The reason for this is that the walls – hayt or suwr – were constructed from desert stones, hasa, or stones from the sea – hasa bahri – bonded only by juss – a limestone mortar matrix, with a protective render of juss to shield the construction. As the stones are irregular they can not form a mechanical bond but rely on the juss for structural integrity, together with mangrove poles over openings and, sometimes, across corners to give additional strength. Maintained, the structures are thought to be safe for thirty years or so but, left to the elements, they quickly deteriorate as water attacks the juss. As an interesting comparison, the construction of this type of wall is not dissimilar from the dry stone walling used in many parts of the United Kingdom for partitioning fields. Although not of the same height as Gulf residential walls, those walls are considered by their builders to be easily capable of lasting their lifetime, and many of them have been dated back hundreds of years, though with a small amount of repair. Essentially their construction is similar to hasa walls. They utilise two skins of large stones to face the inner and outer faces of the wall with smaller stones between the two faces to fill the voids. The juss then provides an additional mechanical bond while protecting from water penetration. Yet the dry stone walls seem to stand the test of time better than the local limestone walls, perhaps because of the harder character of the stones used to construct the dry stone walls. It may also be significant that the stones used in dry stone walling may be better shaped for mechanical construction. The first of the two photographs above shows a cross section of an old residential one-storey wall, illustrating the lack of filling stones in its centre and a significant amount of voids. The second photograph shows a new construction in the traditional manner, with a greater attempt to fill the central area with fill stones. Note the use of cement rather than juss on the face of the wall. the methods of restoration or rebuilding have not replicated the original methods. It is argued that the newer buildings will, at least, be more technically sound. When carrying this out, information on the building in its setting needs to be collected and collated. A study of the original building prior to any work taking place should aim to explore and identify a range of values relating to the site and the building upon it. This study should cover at least the significance of the site, both in general as well as in terms of its specific components. This will incorporate views from a communal, socio-religious, educational and aesthetic perspective, as well as dealing with the site from a local, regional or national point of view.Not only that, but the technical aspects of the building, its structure and decoration, need to be examined and recorded. Following this decisions need to be taken on those aspects of the building that must stay in their original form – even if that means alteration at a later date – and those that must be amended to cover a range of aspects such as safety, purpose and use, and the concomitant decisions needed to explain these where necessary. I believe that there may also have been insufficient work carried out on the operation of buildings both in themselves as well as within their neighbourhood. We are beginning to lose information about living conditions that obtained only a generation ago. This relates to a wide variety of mechanisms such as itinerant merchants both on foot and donkeys, as well as to the operation of households in traditional buildings. Details of this such as the use of ground date stones in place of flour, the use and treatment of low quality water, and play patterns for both girls and boys need to be recorded and made available to those visiting buildings opened as museums relating the past. Without this, old buildings are just objects. In addition to this the details relating to construction need to be investigated and recorded. Already the State is relying on foreign experts to provide details of a number of arts, not just building, which, in many cases are incorrect and do not reflect the true history of the country. Once this history has been supplanted by a different view, the real history will have been lost for all time. Perhaps a couple of brief details might illustrate this. Reconstructed buildings are nowadays held together not by juss, but using cement mortar. At least we know that the old structures were built with juss, but limestone hasa held together with juss behave differently both structurally as well as environmentally from a cement matrix, just as lime mortar might do when used to bond traditional brickwork in Europe, for example. Many of the elements of traditional buildings are constructed of recycled materials. Mangrove poles are a good example of this. the reason why they are incorporated into buildings and stick out from the walls at different lengths is that most people could not afford to match poles and trim them to the same lengths in case they would not be long enough to place in another building at a later date. In addition, random length poles did not cost as much as matched poles. Poles projecting the same distance from the wall suggest a wealth that was not there originally. This, incidentally, is a significant difficulty when renovating buildings. For instance, with the funds now available it is easy to find exemplary specimens to furnish a building, giving it a character it would never have possessed originally, misleading those who now move in and around it. A third example might be doors and windows which were constantly recycled in buildings due to their high cost. It is obviously far easier and cheaper to construct a door opening to suit an existing door than construct a doorway and have a door made to fit it. So, reconstruction is the favoured method of dealing with those buildings selected for preservation. In many respects this has been a relative success if just in terms of existing buildings having been kept for future generations to see. In some cases this may not have been as successful as others. An unfortunate example is the wind tower house in the centre of Doha which, originally constructed within a tight urban environment to draw air down into the house complex, it now stands free of other development, contradicting the rationale for the wind tower. I have added notes on construction and the like to these notes due to the recent trend in the country – the construction of new traditional buildings, of which suq Waqf is an example. It appears that there are policies to promote tourism some of which are leading to the restoration of old buildings. But suq Waqf is in a quite different class; here the development is new construction and, looking at comments on the Internet, it is clear that there is some confusion on the part of the public as to whether they are looking at old or new development. In the West generally, and particularly with regard to Western professionals, there is a strong feeling against this kind of work. The rationale is that new buildings deserve to be constructed from modern materials in a modern style. Suq Waqf is obviously not designed from this point of view but is a deliberate attempt to build in the style of the traditional buildings of Qatar, though it is claimed to replicate the buildings that previously existed there. Criticism suggests that this has not been achieved. The suq fails in terms of its massing, its materials of construction, and its detailing. Criticism has also been levelled at it because it demeans the rationale of the old suq, reducing it to the level of a theme park. Having said that, it has certainly become a popular attraction for tourists. This photograph, taken a generation later in 2008, can be compared with this photograph taken in 1974. Previously I have written of the trend to produce an architecture more suited to a transient population, and it is from this perspective that the suq makes sense. The people visiting and using the old suq are now more likely to be visitors to the country, or those living in the country wanting to learn a little of the past. Whether the suq is effective in achieving this latter objective is another matter, though I understand that it is a popular place for residents to visit. However, popularity and authenticity do not necessarily go together. My own feeling is that while I can understand the decisions that led to suq Waqf being constructed in the manner it has, I wish it had been carried out in a more authentic manner. While it may be true that the old architecture of Qatar has been lost, I think the architecture replacing it should be more reliable in its detailing. Nevertheless, suq Waqf is an interesting attempt to assist the tourism industry in Qatar, as well as telling something of the past to visitors to the country. The first problem is essentially a design issue. The traditional ceiling construction depends on the spanning of space with shandal timbers, the span being dependent upon the strength of the timbers. Normally these timbers span a single room but, when larger spaces are required, then columns stand free as is the case here. As an interesting exercise, compare this space with the interior of a nearby mosque, which is also a renovated structure. At the junction of the ceiling and external walls the treatment of the walls is as might be expected with naqsh cornice decoration at the top of the wall established in the traditional manner. However, the need to produce a large space has resulted in a simple column and beam construction with the beam being taken into the wall in an unfortunate and unusual manner. 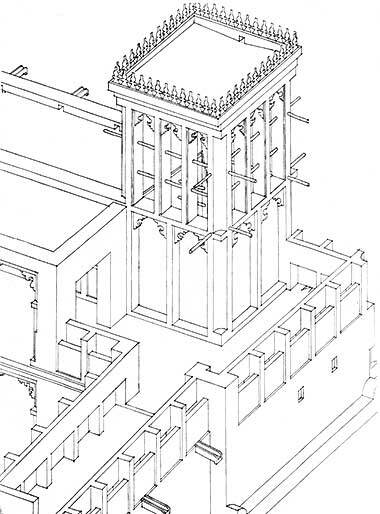 With regard to the free-standing columns, it may be that the junction of beam and column will eventually have traditional detailing soften that junction as is the case in the mosque mentioned in the previous paragraph. Here is the detail of the beam at its junction with the supporting wall and the unsatisfactory manner in which the naqsh has been detailed around it. While the cornice decoration on the beam seems to be continuous with the cornice on the wall, this area is in conflict with the drainage pipework suspended below the shandal. Not only is the beam not centred on the panel, but the design of the panel is not one I have seen elsewhere, although the repetitive fleur-de-lis motif used within the panel is found in some balustrading details. This is an unfortunate detail, perhaps incapable of being satisfactorily resolved. The photograph also shows some hesitation in the detailing of the electric cabling and exposure of reinforcement in the wall – the two bars one above the other rather than side by side as might be anticipated. There is no conduiting and the naqsh has been cut out suggesting that at least some of the cable is to be buried within the wall. Despite these criticisms, it has to be admitted that even though this is a new construction, it has the general appearance of a traditional building that has been upgraded to include the modern conveniences of plumbing and electricity. Perhaps this was the intention. I’m sorry that I do not have a photograph of the completed works to see how these problems were resolved. On the page looking at the building industry, there will be a little more written on construction.